Preliminary Checklist of mayfly families, genera and species known from Eastern Central Africa, with synonyms (including authors and dates for all specific name changes). Research Associate Department of Zoology and Entomology, Rhodes Univesity, Grahamstown, South Africa. This checklist aims to include all possible and known mayfly species occurring in Eastern Central Africa (sensu Barber-James and Gattolliat (2012) (Figure 1). These broad bioregions are adapted from Thieme (2005). This list is provisional and will need periodic updating. Not all species included here have been verified in this region but are expected; more fieldwork is needed to ground truth and expand this list. Several new genera and species are recognised as nymphs but need adult material for species confirmation before description is possible. The 254 mm per annum rainfall isohyet demarcates the approximate northern boundary of the Afrotropical region (adapted from Crosskey and White, 1977). Figure 1. Bioregions of Africa. Note that in the lists below, the current valid names of the species (indicated by •) are followed by subordinate names when these exist (indicated by ○). The subordinate names are followed by an abbreviation in parentheses, indicating their status. All names, valid or subordinate, are followed by the actual author of that name and the date that name was published. The authors responsible for the latest names changes are indicated at the end of each list of synonyms. (syn.) synonym: another name that was proposed independently for the same species. Normally, the earliest published name takes priority. (in part): some of the members of this species were originally described as another species. Barber-James, H.M. and Gattolliat, J-L. 2012. 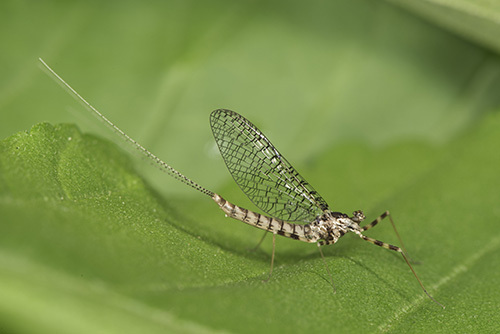 How well are Afrotropical mayflies known? Status of current knowledge, practical applications and future directions. Inland Waters. 2: 1-9. Crosskey, R.W. and White, G.B. 1977. The Afrotropical Region. Journal of Natural History. 11:541–544. Thieme, M.L., Abell, R., Stiassny, M.L.J. and Skelton, P. 2005. Freshwater Ecoregions of Africa and Madagascar – A Conservation Assessment. Washington (DC): Island Press. 431p.